Here are a few of our TOP SELLING books. All you have to do is click on a cover below to read more. First published in 1992, this edition has been completely revised and updated to take account of the latest changes to building legislation, regulations and standards. 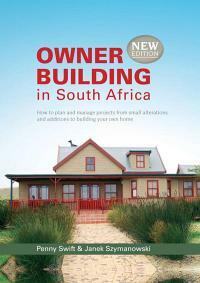 With easy-to-read text, clear drawings, and photographs that reflect contemporary trends in building, architecture and design, Owner Building in South Africa provides all you need to know to build your own home, in one volume. Writer Penny Swift and photographer Janek Szymanowski have a special interest in domestic architecture and the do-it-yourself approach to home improvement. Based on their Swimming Pools and Spas for South African Homes, The Complete South African House Book, Outdoor Style, Brickwork Made Easy: A Step-by-step Guide (and similar titles dealing with woodwork and metalwork), and several illustrated college textbooks dealing with construction topics and welding. This is a clear, concise and essential book for all metalworking (welding) enthusiasts. METALWORK MADE EASY: a step-by-step guide provides a simple and easy-to-follow introduction to the full range of techniques used when working with metal of various kinds. Detailed information about metalworking tools, materials and equipment, together with photographs and step-by-step instructions, will enable you to successfully cut, bend and join metal using the most popular techniques and processes. These include soldering, brazing, brazewelding, gas welding, arc welding and MIG welding. The most common finishing techniques are also covered. These include painting and special effects you can do yourself, as well as specialist coatings and finishes such as galvanising and powder or epoxy coating. Whether you want to make practical items like burglar bars or garden gates, produce your own metal furniture or simply repair existing metalwork, this book will show you how to plan and execute projects with ease. Along with a host of good ideas, there are more than 10 items of varying complexity you can make by following step-by-step photographic instructions. A list of materials is given for each project, and essential tools and equipment are listed. These projects are quite varied, with several which are suitable for complete amateurs, and others requiring more advanced skills. You can start working on the simpler designs with no prior experience; perhaps make a handy hanger or braai tongs, and then move on to the drinks stand or candle stick. Once you are feeling more confident, you will be able to tackle burglar bars, gates and furniture with ease, and can then move onto more complicated projects such as fireplaces and built-in braais. METALWORK PROJECTS MADE EASY is a bright inspirational guide for making metal items and furniture. It has easy to follow step-by-step instructions that will help you tackle welding techniques, even if you have never welded before. Profusely illustrated with more than 350 colour photographs, the book introduces you to different types of metalworking techniques and the best tools and equipment that you can use. There are also helpful hints for cutting and bending metal, and you will see exactly how to make a variety of jigs. The most common finishing techniques and paint finishes that you can use on metal are well illustrated. These include popular contemporary techniques like faux verdigris and fake rust finishes. There are more than 17 different items of varying complexity that you can make just by following the step-by-step projects that are illustrated. All materials and the tools required for each project are listed and explained. Suitable finishes are suggested. If you enjoy making your own designs, you can adapt the different projects to create your very own furniture and stylish accessories. The range of projects includes a table and a chair, candlesticks, lamps, a garden bench, burglar bars and security gates, as well as a handy wine rack, a mirror and an attractive plant stand. The items range from very simple, ideal for the beginner, to relatively difficult. I purchased the e-book Fix it Quick, how to for the home handyman, and i want to print the book for my husband and i see that there is no option on pdf to print. I also cant mail it as the file is too big even if i zip the file. I have purchased the book surely i need to be able to print a copy for my home. 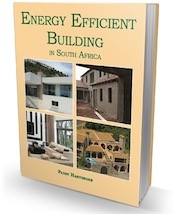 I ordered your book Energy Efficient Building in SA last year via the internet. As I was away from Cape Town for a number of months, I suspect that the book was delivered but returned. It’s an ebook as stated very clearly on the website – we will reset the link for you to download. I am looking for a book called: Build your own braai by Penny Swift & Janek Szymanowski. Lindy you may be able to pick up a secondhand copy somewhere. There are a couple of really good secondhand shops near us – I’ll see if either of them has a copy. I have two copies, one in good conditions and the other worn. I see that a copy sold on Bid or Buy in June for R35 (+ R20 postage and packaging). I found some for outrageous prices HERE! SHOCKING!AND HERE! I can’t believe it. Hardly Afrikaner just yet… I’ll see if I can find a copy; please let me know if you find one first. Thank you so much Penny, I will also see if I can find one. This is for my father, his got stolen. A appreciate all you help Penny, you are a star. Thank you again. I presume it’s the 64 page edition and not the very very old red cover – 24 pager? Yes, the one with the White braai on the cover. I am in Klerksdorp and would like to have that whole information regarding registration,booklets.fees and the venue to gather the info.Pls assist on this matter. Ndaba – what? You need to do a bit of work yourself. We are here to help guide you, not to be told to supply. Apart from which you do’t make sense. Good luck in your endeavours.